JALAPENO POPPER FLATBREAD - Cream cheese base topped with diced bacon, jalapenos, red onion and cheddar cheese. TROPICAL SALAD - Mixed greens, seasoned diced chicken, mandarin oranges, fresh pineapple, red onion, feta cheese, dried cranberry and walnuts. Served with a warm breadstick. 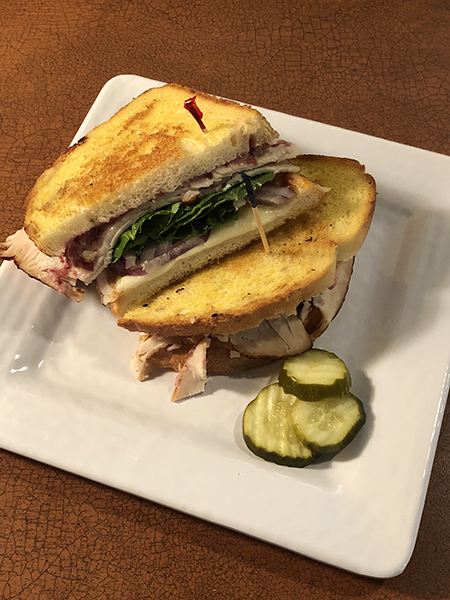 CRANBERRY TURKEY & SPINACH SANDWICH - Sliced turkey, cranberry mayo, provolone cheese, red onion and fresh spinach served toasted on panini bread. CHICKEN CAESAR FLATBREAD - Olive oil base topped with seasoned chicken, onion and our three-cheese pizza blend. Baked then topped with chopped romaine, shredded parmesan, house-made croutons and Caesar dressing. CHEF SALAD - Fresh greens, turkey, ham, bacon, tomato, onion, shredded cheddar cheese and house-made croutons. Served with a warm breadstick. 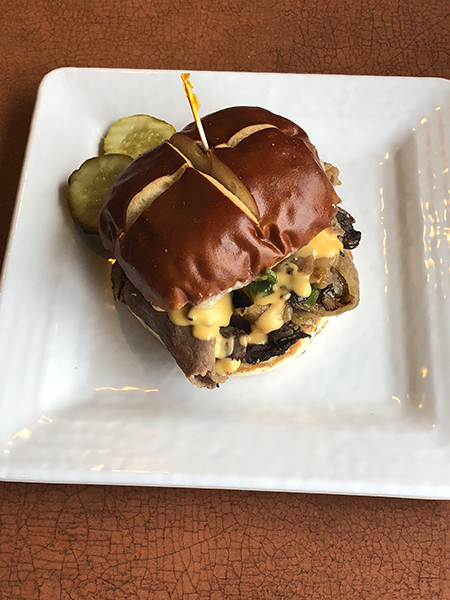 ROAST BEEF MELT - Sliced roast beef, nacho cheese, sauteed mushroom, onion and green pepper. Served on a pretzel bun. TURKEY BACON DELIGHT - Chopped romaine, turkey breast, chopped bacon, provolone cheese, cucumbers, red onions, tomato and house-made croutons. Served with a warm breadstick. PESTO CHICKEN CAESAR - Seasoned chicken, pesto mayo and provolone cheese served toasted on a telera roll. Topped with fresh greens, tomato and Caesar dressing. MEATBALL MARGHERITA - Olive oil base topped with fresh garlic, tomato, fresh mozzarella, house-made meatballs and our three-cheese blend. Topped with fresh basil and a balsamic glaze. ASIAN CHICKEN FLATBREAD - Sesame ginger dressing base topped with diced chicken, green pepper, carrot, cashew and out three cheese blend. BLT SALAD - Shredded iceberg lettuce, warm bacon, tomato, red onion, hard-boiled egg and bleu cheese crumbles. Served with a warm breadstick. 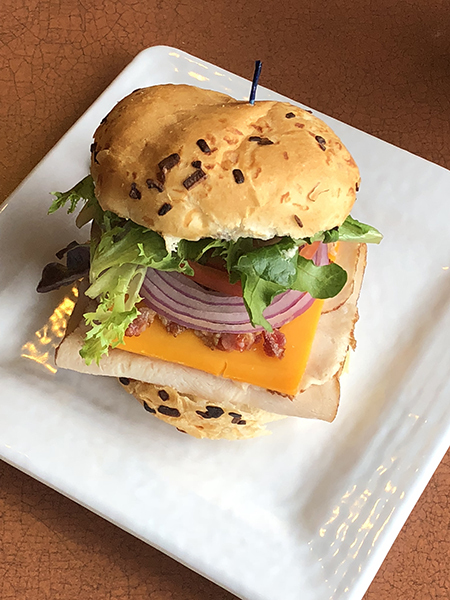 ULTIMATE TURKEY SANDWICH - Sliced turkey, mayonnaise, cheddar cheese, onion, tomato, warm bacon and fresh greens served on an onion roll. 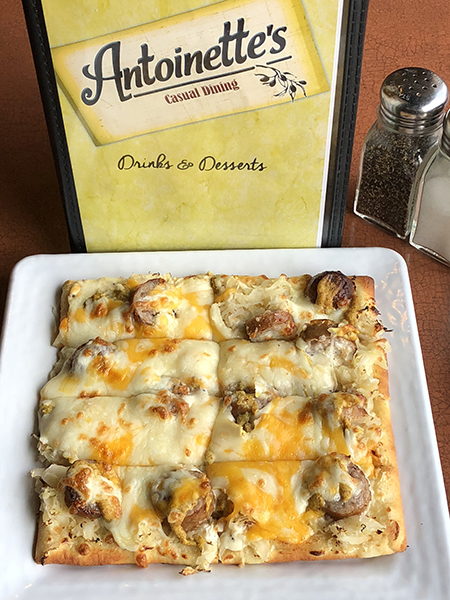 JOHNSONVILLE BRAT FLATBREAD - House-made alfredo sauce base topped with Johnsonville brats, sauerkraut, sautéed onion, brown mustard and our three-cheese blend. ANTIPASTA SALAD - Chopped romaine, grape tomato, roasted red pepper, pepperoncini, pepperoni, red onion, house-made croutons and parmesan cheese. Served with a warm breadstick. CRISPY CHICKEN HONEY MUSTARD WRAP - Crispy chicken, cheddar, mixed greens, tomato and honey mustard wrapped in a wheat wrap. 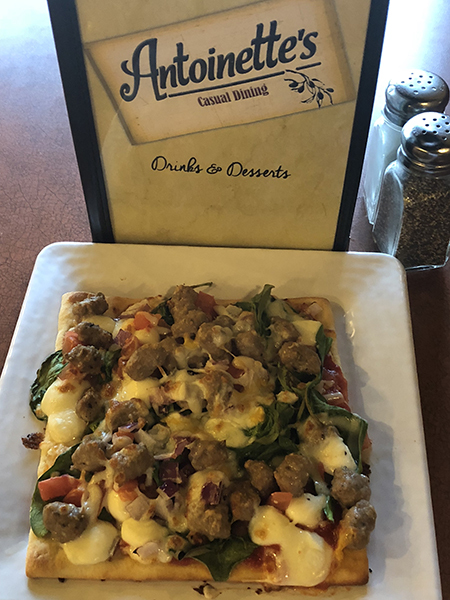 MOZZARELLA & SPINACH FLATBREAD - Pizza sauce base topped with mozzarella, sausage, fresh spinach, tomato, onion and our three-cheese blend. CHICKEN SALAD - Chopped romaine, house-made chicken salad, tomato and provolone cheese. Served with a warm garlic breadstick. Can be ordered as a wrap too. CHICKEN TENDER MELT - Crispy chicken, cheddar, sauteed onion, tomato and a drizzle of ranch served toasted on panini bread. 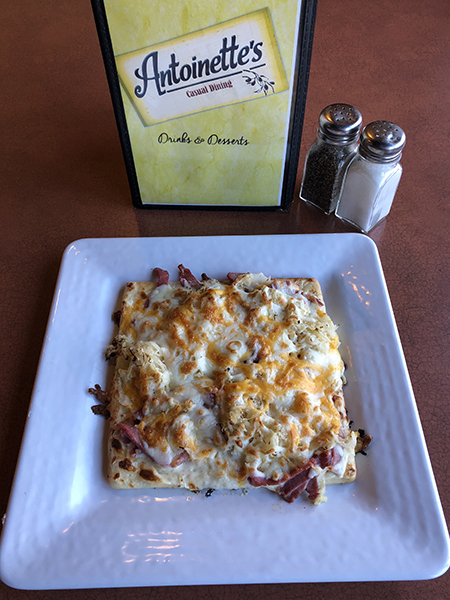 LUCK OF THE IRISH FLATBREAD - House-made alfredo sauce topped with corned beef, Swiss cheese, sauerkraut and our three-cheese blend. IRISH PUB SALAD - Fresh greens, cucumber, tomato, onion, hard-boiled egg and bleu cheese crumbles. Served with a warm garlic breadstick. 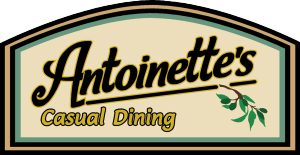 CLASSIC RUEBEN SANDWICH - Seasoned corned beef brisket, Swiss cheese, 1000 island dressing, and sauerkraut served toasted on marble rye. LOADED BAKED POTATO FLATBREAD - Nacho cheese sauce base topped with baked potato, bacon, onion, our three-cheese blend and sour cream. CAPRESE SALAD - Fresh greens, cherry tomato, mozzarella and fresh basil. Served with a warm garlic breadstick. 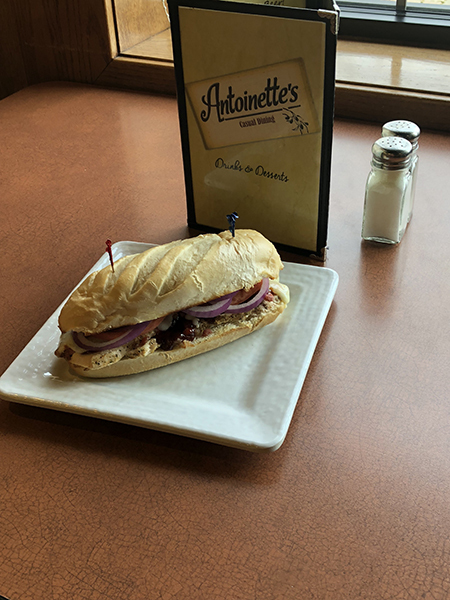 BBQ CHICKEN BACON HOAGIE - Seasoned chicken, bacon, BBQ sauce, cheddar, provolone, tomato and red onion. Served toasted on a hoagie bun. 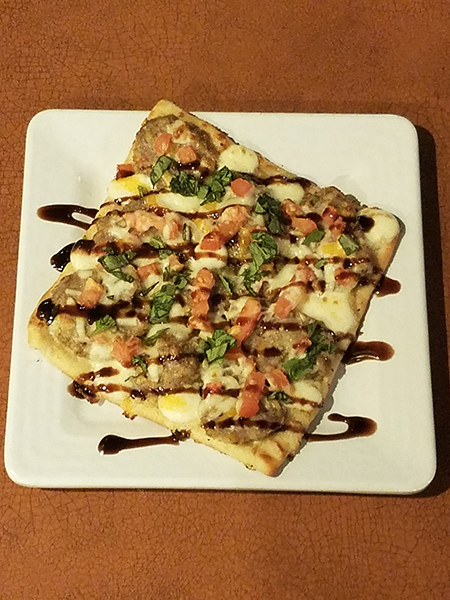 COWBOY FLATBREAD - BBQ sauce base topped with seasoned ground beef, onion, green pepper and our three-cheese blend. 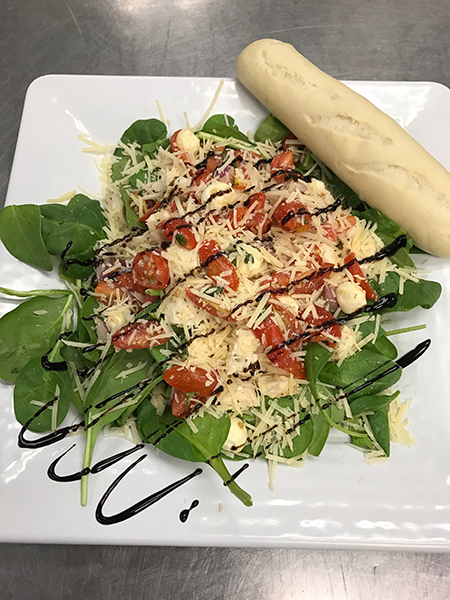 BRUSCHETTA CHICKEN SALAD - Spinach, house-made bruschetta, shredded parmesan and a garlic balsamic glaze. Served with a warm breadstick. BUFFALO BURGER - 1/3rd LB burger patty topped with buffalo cheese sauce, bleu cheese crumbles, tomato and onion served on a Sheboygan hard roll. JALAPENO POPPER FLATBREAD - Cream cheese base topped with sliced jalapeno, bacon, onion, tomato and our three-cheese blend. CHICKEN CASHEW SALAD - Fresh greens seasoned chicken, carrot, green pepper, red onion and cashews. Served with a warm breadstick. 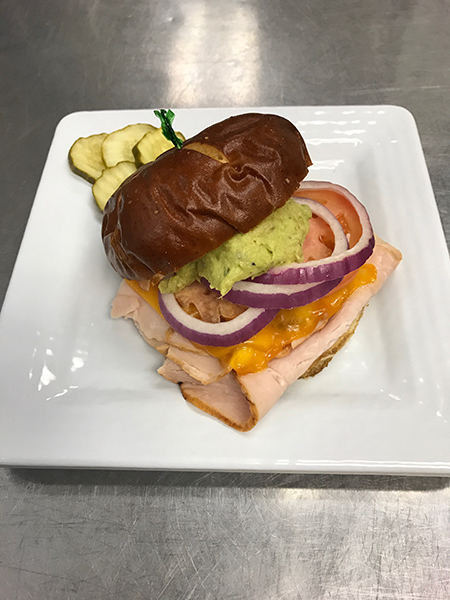 TURKEY BACON GUACAMOLE - Sliced turkey, chopped bacon, cheddar cheese, tomato, red onion and house-made guacamole served toasted on a pretzel bun.